Challenging (young) people to explore creativity with existing garbage objects to promote the use of garbage in expressive works (artworks) and thereby questioning the image of garbage in general. On the one hand, schools often lack employers who can guide students in their creative explorations. Their teachers in art-like disciplines often focus on the quality of the artistic creations themselves, instead of focussing on the thought that provoked them. Also, the teachers are often not artists themselves, being more concerned with the pedagogic issues instead of creativity itself. On the other hand, artists love to share their passion for art and creativity with people and especially young people, who are often more open-minded and less reserved in their approach to art. The two main issues are that artists often do not have any pedagogic education as a backbone during sessions with young people and that the world of artists and the of schools are very distinct and separate (i.e. it is hard to get in contact with one another) and often cooperation only happens when artists contact schools. The aim of the solution is to bring schools and artists together. The solution consists of a few elements. An NGO (BISK) that acts as mediating agency between schools and artists. This agency is subsidized by government, but aimed to become an NGO. A pedagogic course has been created to support the artists involved. In Eindhoven, there is also an organisation that promotes the CKV-week=yearly high-school course for artistic and cultural education in NL. The innovative part of this solution is that it provides a valuable contribution to the creative evolvement of pupils at schools. 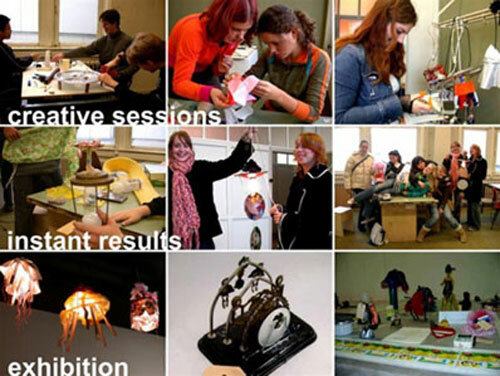 It fills the gap between schools and artists and extra value is added by the pedagogic course for artists. The solution gives students the possibility to learn new tools and materials to express themselves and brings them into contact with real artists. This solution gives an impulse to the creative competence of society as a whole and promotes a creative, open-minded and out-of-the-box, approach to life. The solution is now already put into practise and to provide this solution in other places is relatively simple: the artists, schools and pupils are already available; the only thing to activate it is to set up an agency to bring them together. When it works well, a course can be set up to make the solution more valuable by providing artists with pedagogic insights and practical information. This is a low diffusion case. It is not the first time that schools and artists work together and it seems highly plausible that setting up an organisation to connect schools and artists has been done before in the world. However, at the moment I could not find any agencies/organisations like BISK (i.e. explicitly connecting schools and artists on a regular and well-organized way). The solution is, on a regional level, in an improved stage, for a agency BISK has been set up to connect schools to teachers (i.e. an new service to support the goal). BISK (the mediating agency/organisation) is now subsidized by the government. However, other organisations that have provided the same functionality too (e.g. CPSE Eindhoven), but on a less frequent and constant base, have already proven that it can be done with a minimum of money. On a personal level, the pupils get a chance to get in contact with the “mysterious” profession of the artist and are guided in they creative exploration by a real professional, about the ideas behind the creations and how to translate them. This might give an impulse to be more creative and, by doing so, create a more creative attitude in general. On a social level, this solution enables the creative and cultural aspects of education and might help society evolving into a more innovative and creative society, where need for creative expression is valued and practiced. There are no real benefits for the environment by providing this solution, but it has no negative effects either. When (as in my case study) the artists are using “prosperity leftovers” (garbage of e.g. consumer products, toys), there is an environmental aspect to this solution. It that case it reduces that amount of new materials that are used in creative sessions (e.g. no new paper, paint and clay), and it may also provide the pupils with some insight in the value that is still in the things that we sometimes name “garbage”. The schools need to pay the artists their effort, but for the artists has other strong motivations, apart from the money (e.g. wanting to share their passions, the inspiration they get from working on art with children), the payment does not need to be anything more than compensation for the time they spend on this creative session. The mediating agency also needs to be self-governing to secure independency, but previous attempts have proven that this should be possible (CPSE). However, at the moment it is subsidized by government.